The beaches of the Southeast Peninsula were not reachable until very recently, with the construction of a small road. The area was previously accessible only to those with yachts--or very strong legs. Currently, there is carefully planned, low-key development of the area, continuing the St. Kitts and Nevis tradition of protecting and enhancing the environment, and of using natural assets wisely. These beaches have beautiful white sand, are exceptionally clean, and offer really phenomenal vistas of the tropical splendour of sister island Nevis. These undeveloped beaches include Turtle Beach, Sand Bank Bay, Friar's Bay South and many more. Travelling from Basseterre towards the South East Peninsula, Frigate Bay offers both calm Caribbean beaches ideal for swimming as well as Atlantic beaches perfect for body surfing. On the northern end of St. Kitts are numerous gray volcanic sand beaches, worn from the black igneous rock which makes up the island. They are definitely worth a look, especially if you are used to more common white-sand beaches. St. Kitts sister island Nevis is famous the world over for its miles-long, picture-perfect Pinney's Beach. 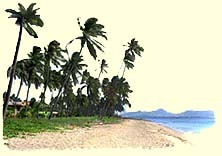 Smooth, soft, sugar-fine white sands are punctuated by coconut palms; just behind the beach lies a uniquely South Pacific-like lagoon. Pinney's is never crowded, and the water, calm and shallow, is perfect for swimming or wading. Other Nevisian beaches include Oualie Beach in a sheltered cove perfect for swimming, windsurfing, sailing and kayaking, Cades Bay Beach, Nisbet beach and the intimate Lovers' Beach. Click here to see what visitors are saying about interesting places in St. Kitts & Nevis.